With the recent heavy rains, many corn and soybean fields have areas where crops are in flooded or saturated conditions. 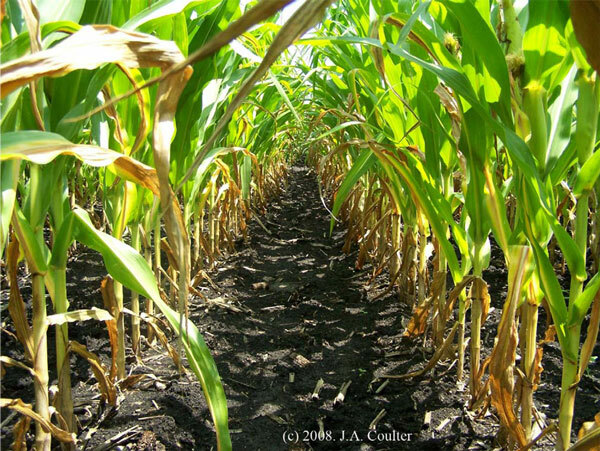 This article discusses agronomic and disease issues for corn and soybean exposed to prolonged periods of high soil moisture. Although corn is at varying stages due to a wide range of planting dates this season, much corn is around the V8-V10 stage of growth. Corn that is at less than the V6 stage of growth will be more susceptible to ponding and flooding since the growing point is still under the soil surface. Given the June 22nd calendar date, replanting corn is not an option. We will have to wait and see how soil flooding affects corn mortality. Completely submerged plants are at higher risk of mortality than partially submerged plants. Survivability is impacted by how fast the water recedes and temperatures during the flooded conditions. Cooler temperatures (mid-70’s or cooler) are generally better for crop survivability. 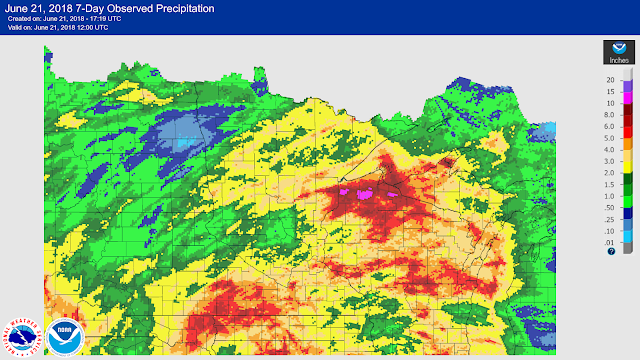 Generally corn should be able to survive a couple days of flooded conditions, but this is complicated by the fact that many spots have flooded multiple times this season. Some root death is likely in flooded soils and new root growth will be hindered until the soil adequately dries. Affected plants could be subject to drought stress if dry conditions follow. After the water recedes we will have to assess drown-out areas and determine how best to manage them. Although accessibility to these spots may prove challenging, providing some sort of vegetative cover to aid in weed management and to help prevent fallow syndrome is recommended. Read more on fallow syndrome and utilizing cover crops to prevent it at https://z.umn.edu/fallowsyndrome. It may be prudent to consider more permanent vegetative cover in areas that persistently flood out. Modern planting and spraying technology (i.e. section shut-offs) have made it easier to manage around vegetative cover. Wet soil conditions in the spring raise concerns that nitrogen (N) applied in early spring or prior might be lost. 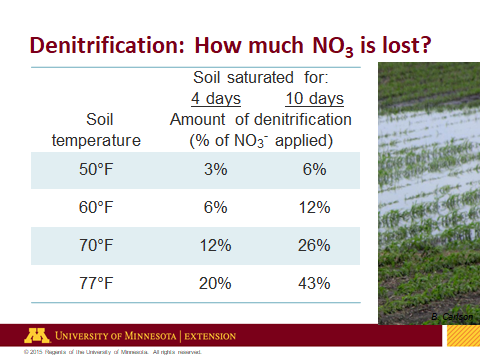 When soils become too wet, the potential for N loss is directly related to the amount of N present in the nitrate (NO3-) form. With the exception of urea-ammonium nitrate (UAN) solutions that contain 25% of the total N as nitrate, or ammonium nitrate that contains 50% of the total N as nitrate, most commercial fertilizers being used today are in the form of ammonium (NH4+) or forms that rapidly transform to ammonium (like anhydrous ammonia and urea). In the ammonium form, N is retained in the exchange sites of soil particles and organic matter. The transformation of ammonium to nitrate, or nitrification, is done by soil bacteria that need oxygen. In fields where ammonium-based fertilizers were applied within a few days before soil conditions became excessively wet, the potential for N loss from the fertilizer is minimal as there was not enough time for the fertilizer to nitrify. Since urea is soluble in water, the only concern would be if substantial precipitation occurred soon after urea was applied in well-drained fields. In sandy soils or heavily tile-drained soils it is possible to move urea or nitrate as much as a foot for each inch of rain. On the other hand, movement is only approximately five to six inches for each inch of rain in a clay loam or silt loam soil. That said, between rain events nitrate will start to move back up as evaporation from the soil surface creates an upward suction force that moves water and nitrate closer to the surface. Similarly, evapotranspiration from actively growing crops will result in a similar suction force in addition to some nitrate uptake by the crop. Nitrogen loss will occur in fields where N from fertilizer or organic N from the soil was present in the nitrate form before the soils became excessively wet. In fine-textured soils, water-saturated conditions cause N lost through denitrification. Denitrification rates increase after about a day under oxygen-depleted conditions that result when soil pore space is filled with water. Under these conditions, soil microbes utilize nitrate for respiration, and N is released as a bi-product in gaseous forms that are lost to the atmosphere. For each day the soil remains saturated with water under warm soil temperatures, it is possible to lose as much as 5% of the nitrate-N in the soil. In coarse-textured soils or soils intensively tiled, N loss occurs mostly by leaching below the root zone or into tile lines. Figure 1. Early N deficiency in corn. Nitrogen deficiency is characterized by yellowing along the leaf midribs, starting at the leaf tip and moving toward the stalk (Figure 1). Nitrogen deficiency will first be observed on the lowest leaves of the plant. The chlorotic areas will turn brown as the season progresses (Figure 2). Severe N deficiency will result in a poorly-developed crop canopy that will be unable to intercept all of the sunlight during grain fill. 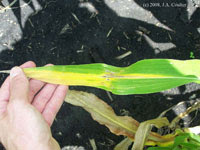 Nitrogen-deficient leaves also have a lower capacity for photosynthesis, further limiting the potential for grain fill. Nitrogen uptake by corn from emergence through the V6 (six leaf collar) stage only represents about 5% of the total plant uptake. However, starting at about the V8 (eight leaf collar) stage, there is rapid accumulation of N by the plant, with about 60% of the total N uptake occurring between V8 and silking. Thus, it is important that N-deficient areas are detected early, and that supplemental N is sidedressed on these areas as soon as possible. To determine whether supplemental N should be applied in corn, consider the U of M supplemental nitrogen worksheet for corn. For entire fields or portions of fields meeting the requirements for supplemental N, this worksheet recommends a rate of 40 to 70 lb N/ac, depending on the situation. Additional information on N management during this difficult growing season can be found in a recent Minnesota Crop News, Sidedressing Nitrogen in this Challenging MN Growing Season. Although soybean is generally sensitive to excess water, soybeans can survive underwater for a week or more under ideal conditions. Typically soybeans tolerate 48 hours under water quite well, but flooding for 4 to 6 days can reduce stands, vigor, and eventually yield. Many factors determine how well a soybean crop will tolerate flooding. The most important factors that determine the fate of flooded soybean fields are: 1) duration of the flooding, 2) temperature during the flooding, 3) rate of drying after the flooding event, and 4) growth stage of the crop during the flooding. Yield losses are seldom noted in fields flooded for 48 hours or less. Four days or more of flooding stresses the crop, delays the plants' growth, and causes the plants be shorter with fewer nodes. Flooding for 6 days or more can depress yields significantly, while flooding for a week or more may result in significant (or entire) losses of stand. Temperature during the flooding event plays a large role in determining the fate of a submerged soybean field. Higher temperatures cause the soybean plant to more quickly deplete its stored energy. Additionally, soybean plants appear to be very sensitive to high carbon dioxide (CO2) levels in the soil. Higher temperatures cause plants and soil microbes to respire at high rates that quickly deplete the water of oxygen and increase CO2 levels. Cool, cloudy days and cool clear nights greatly increase the survivability of a submerged soybean crop. The rate of field drying after a flooding event also plays a large role in soybean survival (Sullivan et al, 2001). Also, researchers have found yield reductions to be much greater on flooded clay soils than on silt loam soils when flooded for the same period of time (Scott et al, 1989). At the V4 stage, these researchers reported yield losses of 1.8 bu/ac per day of flooding on a clay soil and 0.8 bu/ac per day on a silt loam soil. The effects of flooding are even more detrimental during the reproductive phases of development. For example, flooding at the R1 stage caused yield losses of 2.3 and 1.5 bu/ac per day on clay and silt loam soils, respectively. Even larger yield losses would be expected in soybeans at the R3 to R5 stages. Some of the main indirect effects of flooding on soybean yields are: 1) root diseases, 2) N deficiency, 3) and other plant nutrient imbalances. Caring for recuperating soybean stands should focus on reducing crop stresses where possible. For example, cultivation should be considered to increase soil aeration and herbicide stress should be minimized or postponed where possible. Saturated soil conditions may lead to significant seedling diseases in soybean and corn. Wet and flooded soils are especially favorable for the soilborne, moisture-loving pathogens Pythium and Phytophthora. Pythium appears to cause most damage to seedlings of soybean or corn, and Phytophthora can damage soybean seedlings or start infections in the early summer that may develop and kill soybean plants later in the summer. Cool, wet, soils can also favor sudden death syndrome, with is caused by the soilborne fungus Fusarium virgulifome (previously named Fusaium solani f.sp. glycines). For more information on soybean and corn diseases, please visit the Minnesota Crop Diseases web site (https://z.umn.edu/cropdiseases). Ritchie, S.W., J.J. Hanway, and G.O. Benson. 1997. How a corn plant develops. Iowa State Univ. Coop Ext. Serv. Spec. Rep. 48. Iowa State Univ., Ames. Scott, H.D., J. DeAngulo, M.B. Daniels, L.S. Wood. 1989. Flood duration effects on soybean growth and yield. Agron J. 81:631-636. Sullivan, M., T VanTooai, N. Fausey, J. Beuerlein, J. Parkinson, A. Soboyejo. 2001. Evaluating on-farm flooding impacts on soybean. Crop Sci. 41:93-100.